Cần Thơ is the fourth largest city in Vietnam, and the largest city in the Mekong Delta. The city is nicknamed the “western capital” (Tây Đô), and is located 169 kilometers (105 miles) from Ho Chi Minh City. Cần Thơ’s climate is tropical and monsoonal with two seasons: rainy, from May to November; and dry, from December to April. 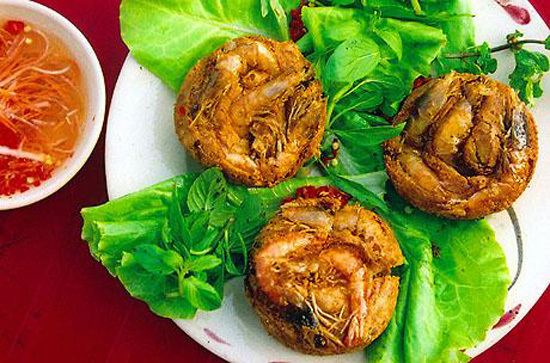 In Cần Thơ, the best rice cake is made by the family Huynh in Binh Thuy District. 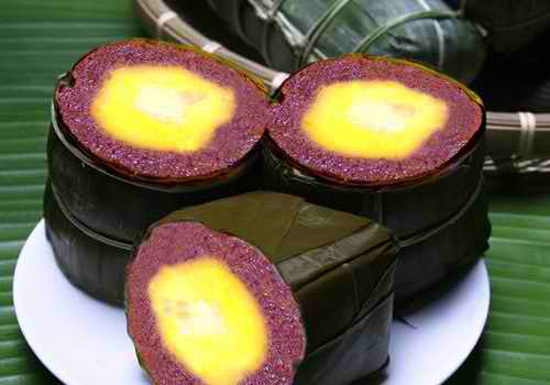 The Huynhs and their descendants have made the unique rice cake by using the steamed magenta plant, using the rice cooking water, to wrap the interior, which is the sticky rice cake made out of coconut milk, meat, salt duck eggs. In order to make a perfect rice cake, the most important part is to select the perfect sticky rice, which consists solely the sticky rice but not any other rice in it. The rice is put into the water with the magenta plant to produce a natural magenta color. The cake is chewy, combines with the sweet of the meat, and the salty of the eggs. 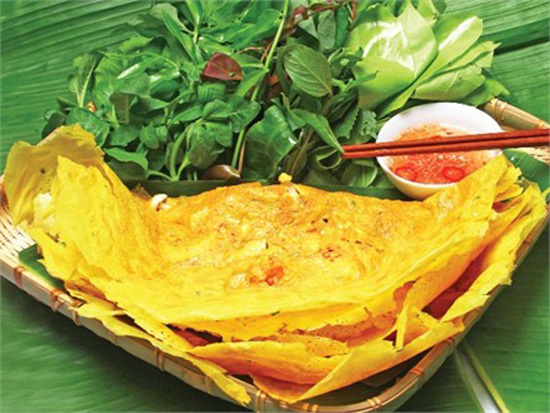 This type of rice cake is different from the Vietnamese traditional bean rice cakes with white bean or black bean with cilantro fat or banana, which are usually sold in Xuan Khanh, An Thoi, Mit Nai markets. Many tourists who came to Cần Thơ usually come to the place of making to buy the cake. 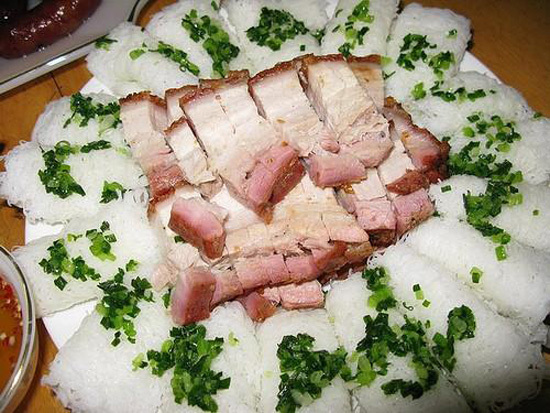 The best grilled rolls are made from the fresh, without fat, pork. The meat is smashed, then balled, then grilled on charcoal. The meatballs, string by the bamboo sticks, stick together to make a roll that is greasy and delicious. Taking out the bamboo stick and you will have a perfect ingredient to eat with the Bánh hỏi, a Vietnamese dish consisting of rice vermicelli woven into intricate bundles and often topped with chopped scallions or garlic chives sautéed in oil. 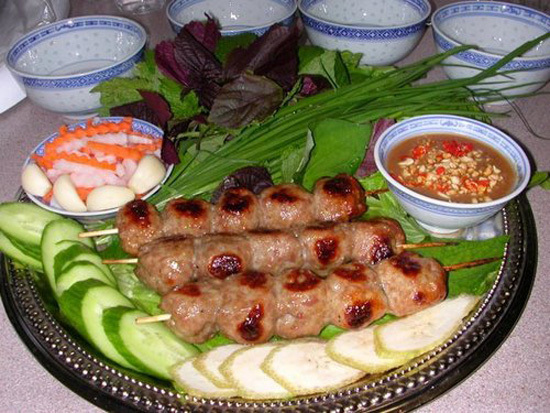 One of the best Bánh hỏi is the Phong Dien. 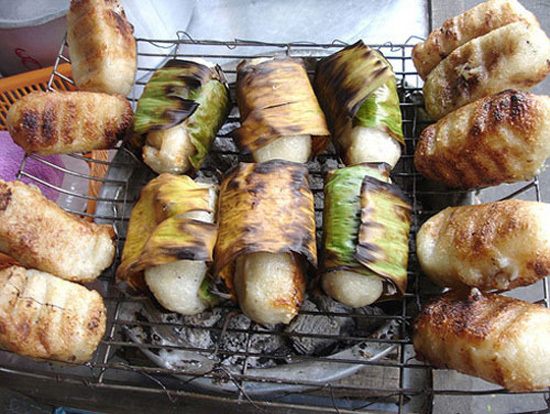 In Cần Thơ, the banana buns are small. Not so long, not so fat, the buns have the brown of the under-burnt cooked rice from the outside, the white of the perfectly cooked rice in the inside and the yellow of the perfect ripe banana. When it is raining, eating the hot, and delicious banana bun from the banana cart is might just be the best moment of your life. The snails are steamed, and then grilled on charcoal. While grilling the snails, it is also the time to make the sauce. You will need: fish sauce, pepper, garlic. Until the water inside the snail is emptied, it is the time to serve. The grilled snail is perfect, not too spicy, not to salty, and crunchy. 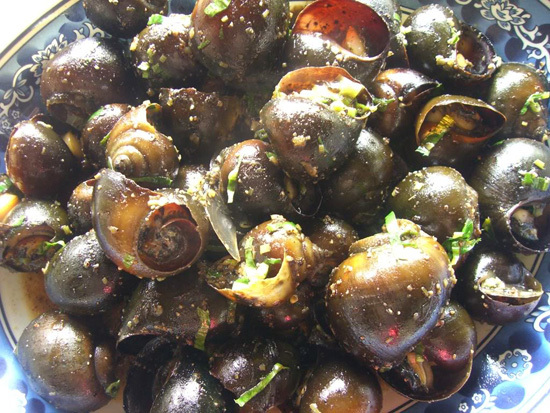 The snail can be overcooked because the shell. The people from Cần Thơ only eat the cake as a snack, so it is only eaten in the afternoon or in the evening, from 4pm to night. The cake is served with sweet-n-sour fish sauce, some lettuce, fish, mango shoots, mustard, basil. The smashed baked pea is the cake crust, while the fried shrimps and the meat is the core. Dipping the cake into the sauce with some slices of pickles, you can feel the entire Southern flavors melt inside your tongue. 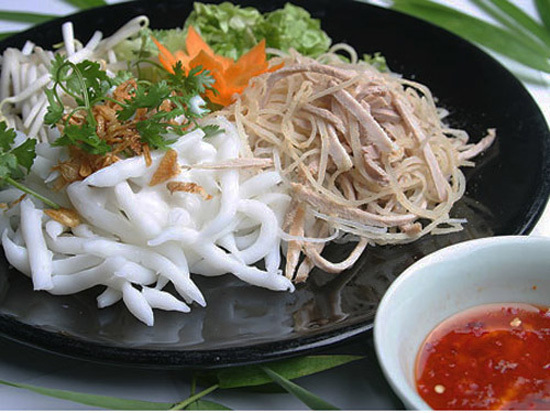 Bánh tầm bì is a southern Vietnamese dish of thick rice and tapioca noodles, tossed with herbs and pork, and drenched in thick coconut cream dressing. The flavor of the noodle is special. Steamed inside the hot charcoal oven, the noodle is thick, and looks delicious. The fish sauce is clear and yellow. The fatness of the coconut always mixes with the thick noodles, which is eating along with sprouts, pickles, and some cilantro-oil mixture. A simple and cheap breakfast. From everywhere and anywhere, the people in Cần Thơ will always miss this noodle. Coming to Cần Thơ, don’t forget to tour down to Phong Dien District by boat and visit the Minh Canh garden, where the fruits are abundant, and to eat and enjoy the famous Bánh hỏi and the delicious grilled pork. Bánh hỏi, a Vietnamese dish consisting of rice vermicelli woven into intricate bundles and often topped with chopped scallions or garlic chives sautéed in oil. The Southerners love the dish to have some oil-cilantro mixture. The white Bánh hỏi, combines with some herbs, the hot and flavorful pork and the ultimate sauce will make you to come back for more. The appeal of hotpot lies not only in the rustic Mangrove Apple but also in the very characteristic flavor of the dish. The soup is sour not too much, but also not too less. In order to make the delicious hotpot, the apple has to be cooked first, otherwise, the hotpot will be bitter. Depending on the season, the hotpot can be cooked with many type of fishes such as pangasius, basa, catfish, tilapia… More expensive ingredients will be shrimp, or crab. In the flooding season, it is essential to have some chopsticks flowers, banana, and many sour soup herbs. Nothing is better than fish and rice. 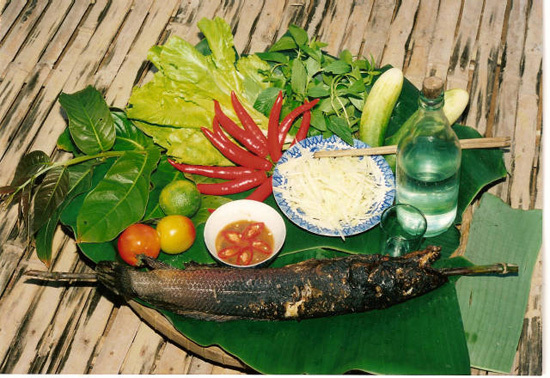 The grilled snakehead (the best is to grill with straw) is the oldest dish in the Southern land – the land that has captivated the love of many food lovers. To catch the good snakehead, you have to wait after the flooding season, when the pouring rains are just breezes then the fishes are starting to grow. The perfect one is not too big, no bigger than an adult arm, which can be harpooned from one end to the other. After the fish is ready, put the head of the fish to face the ground, surround the fishes with straw and set the fire. When the fire is done is when the fishes are ready. In the meantime, ready some lotus leaves, banana leaves to place the fishes on. 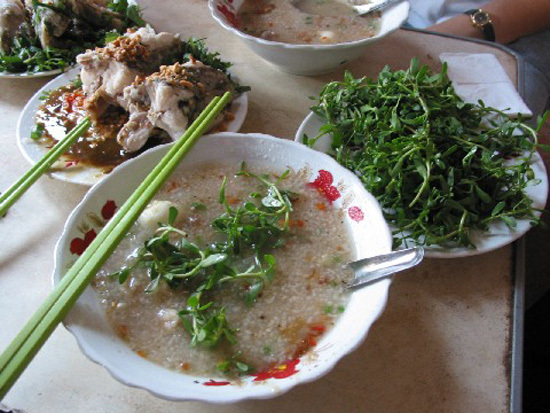 The fish is served with the herbs; dip into salt with chili or garlic chili fish sauce. This dish requires hands to eat with. After the porridge is cooked, then letting in some materials. After the heat of the porridge pot swells in with the fish, ready the fish sauce, and enjoys the hot porridge with some white rice vodka. You can add in some eggs into the porridge. The fish is nutritious, the endive, the Oscars herbs are good for your health, eaten along with the porridge is even better than any medicine. 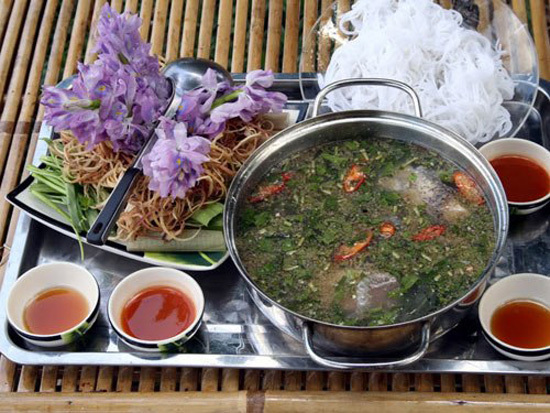 The sweet of the rice, the fat of the fish and the indescribable flavors from the herbs make the dish so captivating to any tourists who come to the capital of the West. From downtown Cần Thơ, you only need 10 minutes of taking motorcycle ride to Dinh Tien Hoang Street near Hung Vuong Bus Station. There are many places serving rock crab, but this area is the best of them all. 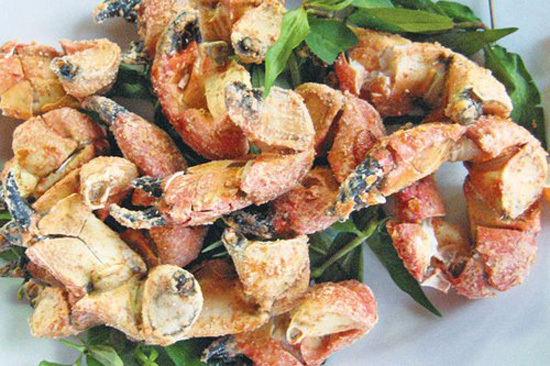 The rock crab is turned into so many delicious dishes such as beer steaming crab, boiled crab, rock crab porridge, rock crab noodle, but the best is the salt fried rock crab. The rock crab is big as an expanding adult hand, its shells and pincers are purple, and the shape is like the paddy field crab. The rock crab usually lives in rocky areas, reef of the island or the rock cliff of the South coast. Their pincers are strong and solid like rock, in order to eat the inside, you have to smash it. Their meat is white, soft, sweet and is perfect for the salt-n-pepper lemon mix. You will want to come back for more.